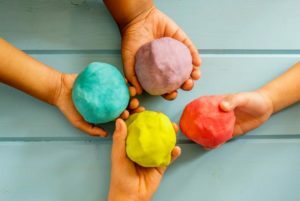 Winter is a great time to get cozy with some indoor activities and crafts – and one which we’ve noticed children just can’t get enough of, is homemade play dough! If you have a child who loves to bake and create, getting them involved in making it can also be a great activity in math, measuring, combining, mixing, and following instructions! Place the flour and baking soda in a bowl. Combine salt, water and a few drops food colouring in another bowl and stir it well. Pour the water and salt mixture in with the flour. Knead with your hands until the desired texture is achieved. You might need to add a bit more salt or water. Add vegetable oil and mix in well. Tip: To keep the play dough from drying out, store it in an airtight container.